I think this is one of the most common questions or misunderstandings that I hear. Where do I go to get more content? Where do I find the storybooks I've uploaded? Do you ever get confused about where to go? First of all, to make your projects, you need content. 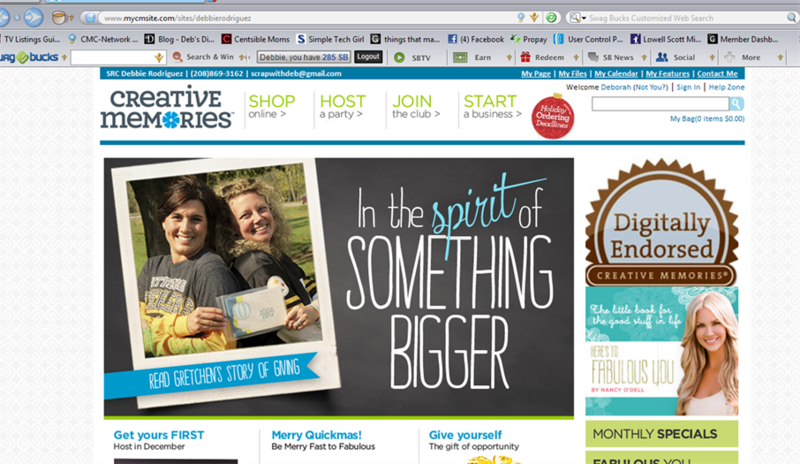 I'm talking about the Pre-Designed pages, the Digital Kits, etc. that put the finishing touches on your pictures. 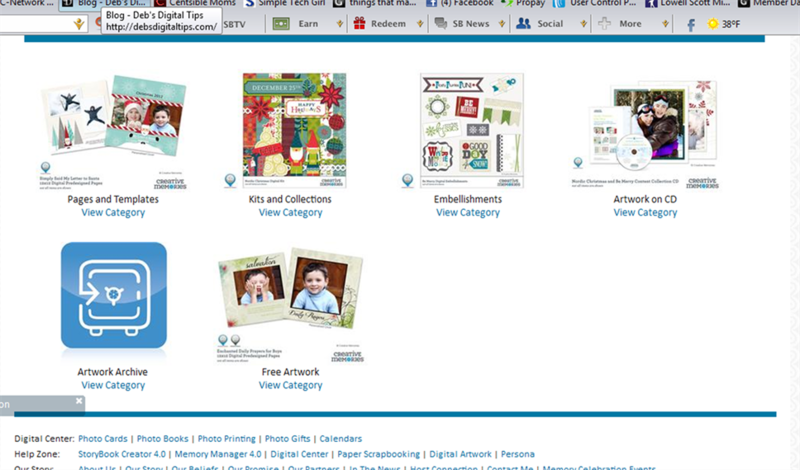 This is also where you can find templates for Calendar projects and fun personalized cards. CM adds new content to my site every month. The place to find all of these things and more is on my CM website. 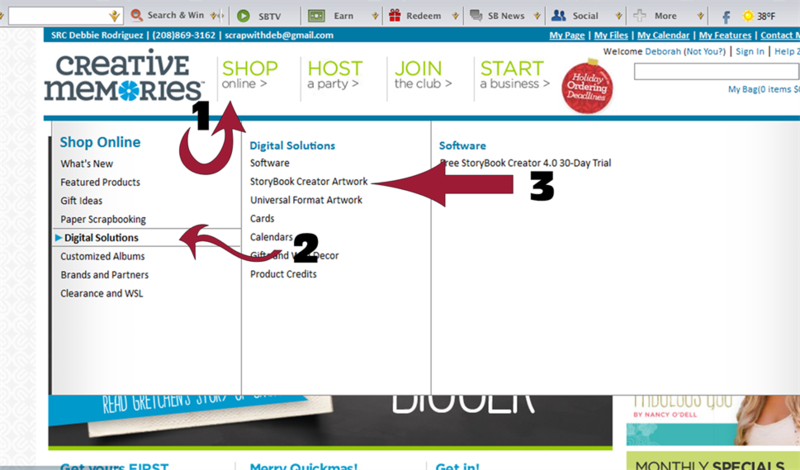 To shop for digital content from here, all you need do is HOVER over Shop Online, and then HOVER over these links in order. Once on the Storybook Creator Artwork page, you'll be able to narrow down your options based on what type of content you want to look for. 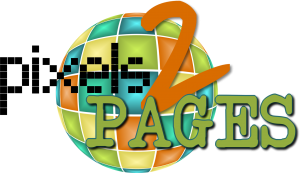 Pages and Templates are what used to be called Predesigned pages. Basically, the beautiful scrapbook page is already designed for you by the experts, and all you have to do with these is drop the photos in their spots and type in your text. Simple. They come in many different themes and in the different book sizes. Kits and Collections are much like the Power Palettes and Paper Packs that CM has for traditional scrapbooking. These are the individual “sheets” of paper and “stickers” that you can add to a page or use with the many different shapes available. I use these quite a lot with the Click n' Fill page templates. Embellishments are the extra little goodies that just add some bling to your page. Some of these mimic the embellishment packages that CM has available for traditional scrapbooking, while others are fun little items like paper clips and stitching graphics. Artwork on CD is pretty much just like it sounds. It's a CD format of groupings of some of the content in the categories above. Usually there may be a kit as well as templates bundled on the came disc. Not all digital content is available on CD. Shipping charges will apply to an CDs purchased. Artwork Archive is where older digital content is stored. You can still purchase it, but sometimes at a higher price. Free Artwork is a category of predesigned templates that can be used in Storybook Creator, but may not be fully editable. This means that you have to use the template the way it is, you won't be able to move individual elements around on the page. Every month, CM introduces some new digital content that will be available for download. The easiest way to find the new content is to go to Shop Online / What's New / Digital. Then just scroll through as usual. These items will still be found in their respective categories as well. I hope that helps answer the question of where to find content. 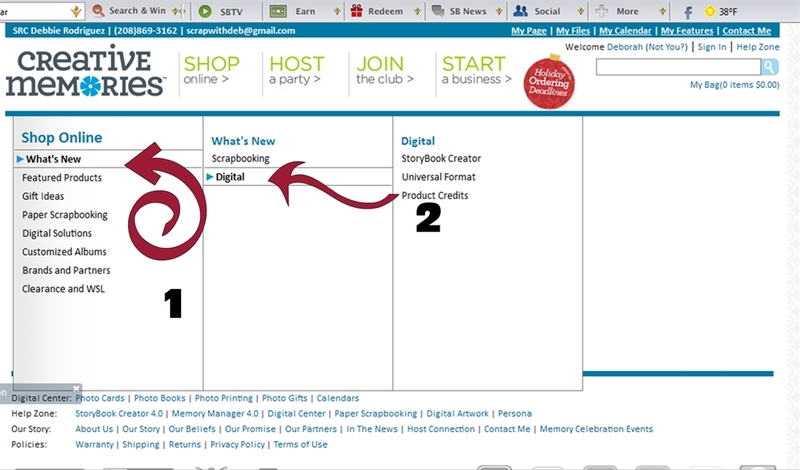 Next time, we'll talk about the Digital Center and where your Storybooks go when you upload them.